Shepard's Connecticut Case Names Citator is a companion product to Shepard's Connecticut Citations. For pricing or to place an order, please contact us at 1-877-394-8826. Shepard's Connecticut Case Names Citator is a companion product to Shepard's Connecticut Citations. It's what you need when you know the name of a Connecticut case, but not its citation. This convenient research tool will help you locate the citation for a case you need, even when you know just one party's name. 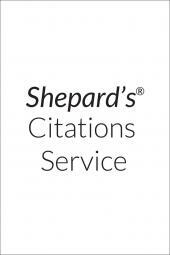 Then you'll be set to Shepardize your citation in Shepard's Connecticut Citations.